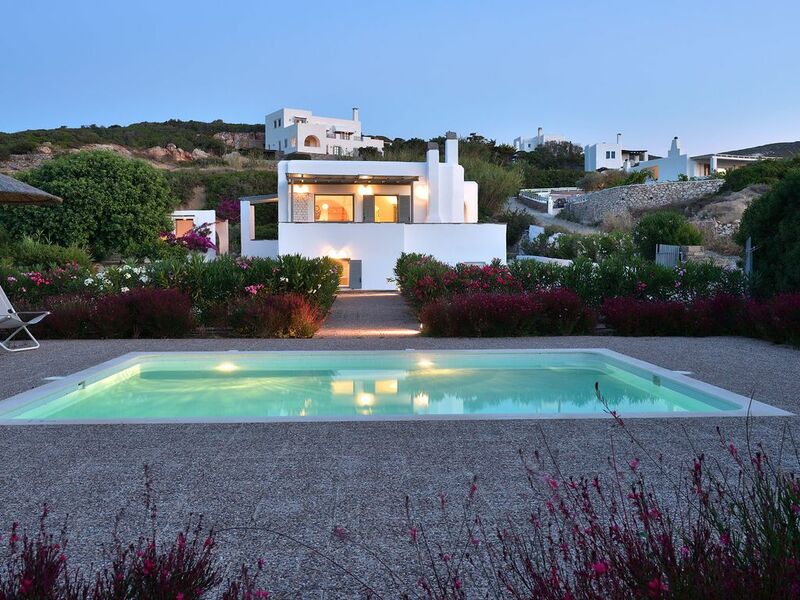 Villa Rosebay, the paradise in Paros. This exclusive property, located in a privileged position over Kolibithres Bay, is blessed with extensive sea views over Kolibithres and is next to famous and cosmopolitan Naoussa with intensive night life, traditional stone paths, restaurants, shops and the picturesque small harbor with the Venetian Castle. Various terraces and relaxation areas embrace the property and its oversized swimming pool. Around the pool there is a colorful garden and comfortable sun-chairs while a nice umbrella protects you from the sun. Two separate outdoor dining areas equipped with a Greek-style BBQ are perfect for entertaining guests during hot sunny days or for romantic al fresco dinners. The entrance of the house opens directly onto a well decorated living and dining room where dominates a big window-portrait facing Kolibithres Bay and pool. The living room has 3 comfortable sofas and one of them could be converted in a double sofa-bed and there is access to a shadowed veranda with unobstructed sea view and pool view. Adjoining, a fully equipped kitchen leads directly to the covered with wooden pergola BBQ area and the pool. Left from the main entrance, there is a hall that leads you to the first shared bathroom with shower and then to the master bedroom (with en-suite facilities) and the second bedroom. Both bedrooms provide AC facilities and have double beds. Few steps down of the ground floor (with separate and exterior entrance), there is an independent studio with a private veranda and direct access to the pool. This private studio provides a private bathroom, a kitchenette and a comfortable double bed. Villa Rosebay is by far one of the most comfortable properties on the island, both for its unique privileged position and for the unparalleled comfort and beauty it offers to its guests. Very good location. Close to Naoussa, in quiet area. The villa is quiet well equiped. Typical villa from Greece. Owner very sympathic. - It is located 1 km from famous Naoussa, 2 km from Kolibithres and few minutes’ drive from capital of Paros, Parikia.